Do you love baked goods but just kind of wish some of them were a little healthier? 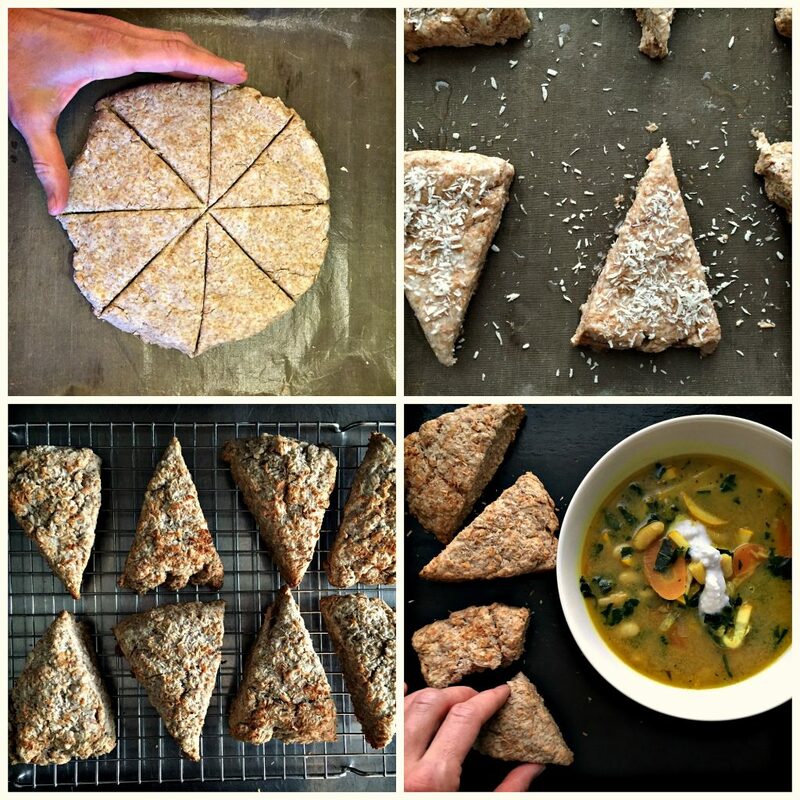 These vegan coconut scones are the answer to that. I have to admit: I love baking. I love the process of creating the product; love the smell of it baking in the oven; love the moment when the timer dings and I can pull that delicious thing out of the oven to barely cool before digging in. Don’t you? But nowadays I try to really limit white flour and sugars, many of my old baking favorites need to be reworked in order to fit into my new way of eating. It doesn’t always work out well. Sometimes, using an alternative for the flours or a different kind of sugar or choosing to leave out eggs can make it really difficult to create a successful product. (As a full disclaimer: I do use eggs – often. They are a great source of protein, and a staple in my diet – I just didn’t want to use them here.). The risk is the product won’t hold together and instead, you’ll have a crumbling mess instead of a cookie, muffin or cake. Or, you’ll change out the sugar and you’ll have a puffy product where you wanted a flat one or a chewy product when you’d been hoping for cakey. It’s tricky sometimes, but so worth experimenting with to find out what works. I was craving scones. 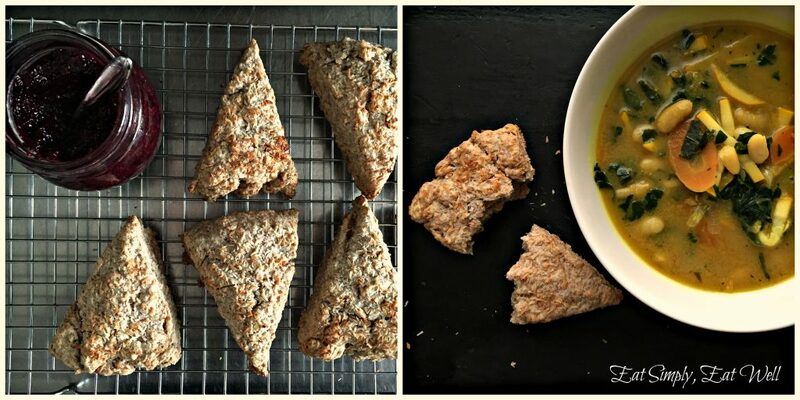 I wanted something that could replace both a biscuit and the sweeter scones often served with coffee or tea, but also wanted to experiment with using coconut oil to replace butter and plant-based milk to replace cow’s milk. I wanted something that was delicious all on it’s own, but suitable with everything. Could I make these vegan? Turns out, yes I could. And since coconut itself has a natural sweetness, I opted to take the (small) risk of leaving out the sugar as well. The results are really delicious. 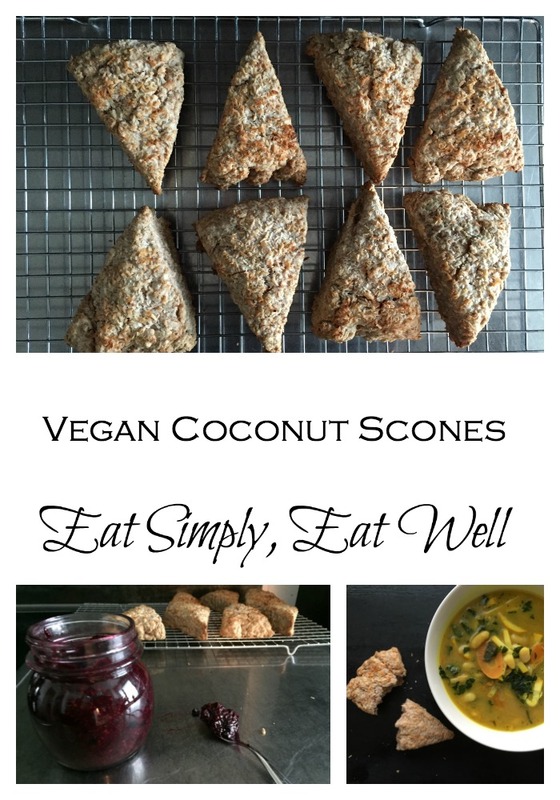 These simple, healthy, vegan coconut scones are super versatile: you can take them to the sweet side with a mixed berry chia jam (or any other jam of choice) or work them into a savory meal and serve them with one of your favorite soups. Packed with good fats, all the fiber and nutrients of whole grains, and no added sugar, eggs, or dairy, you’ll find that these suit pretty much any occasion. If you or someone you’ll be serving these to has a gluten sensitivity – no problem! Simply substitute your preferred gluten-free flour mix for the whole wheat flour. If you can, try to get a gluten-free mix that contains a lot of whole grains so that you’ll be getting good nutrients and fiber from the flour. Unfortunately, a lot of commercial gluten-free flour mixes use refined flours, and while gluten-free, are really just another form of junk food. Note: you’ll be using a chilled can of coconut milk with this, so, pop one in the fridge in the morning of or the night before the day you want to make these. Sorry – but that small hassle is worth it! Combine the flour, coconut, baking powder and salt in a medium-sized baking bowl. Add the coconut creme and coconut oil, and use a pastry blender or fork to mix the fats into the flour until the mixture forms lumps about the size of peas. Pour in the coconut water and stir until it begins to clump. Gather the mixture in your hands and gently press it into a ball. Transfer the ball of dough to the baking sheet and press it into a 1″/2.5 cm high round disk. Cut the disk into 8 even triangles. 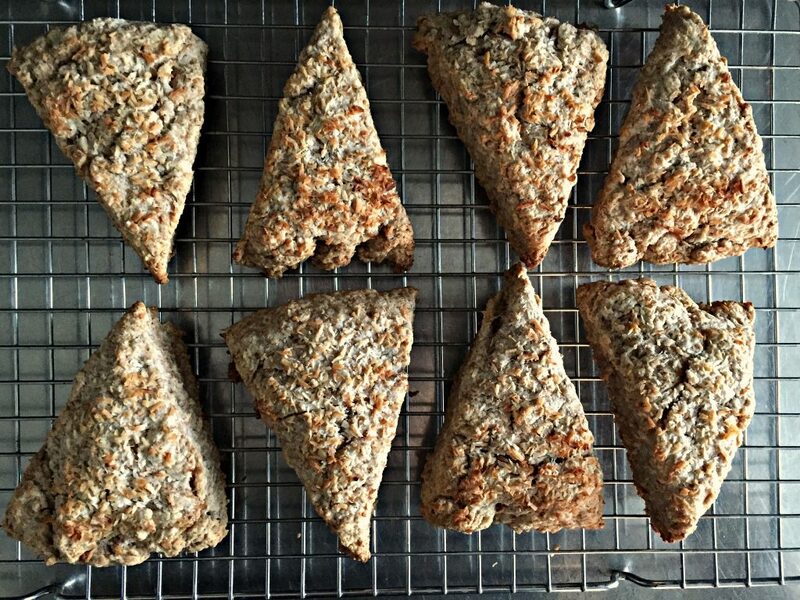 Separate the triangles and space them out evenly on your baking tray. Brush the top and sides of each scone with coconut oil and sprinkle desiccated coconut over the top of each one. Bake for 10-12 minutes until puffed and golden brown. Remove from oven and transfer to a cooling rack. Did you like this recipe? I’d love to hear from you in the comments below! Are you missing out on the ESEW newsletter? Scroll back up to the top of the page and sign up for our newsletter with recipe tips and tricks for busy, hungry, good-food-loving people. 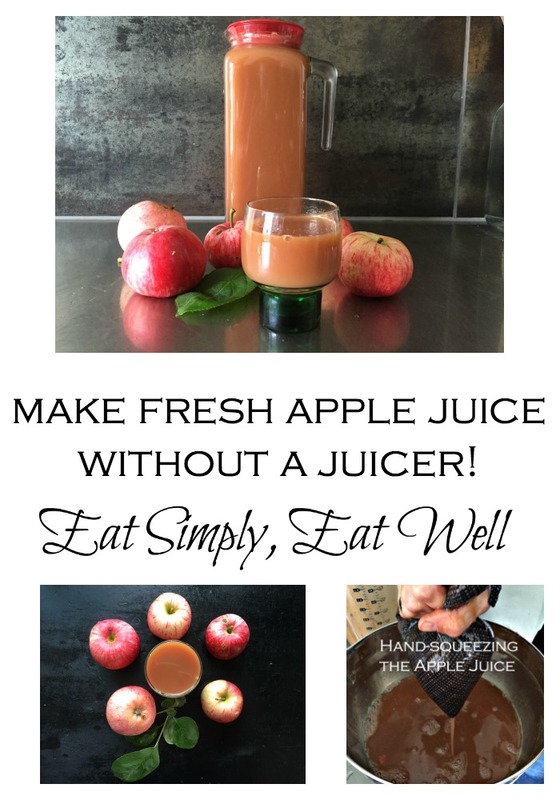 Make Fresh Apple Juice – Without A Juicer! Ladies and gentlemen, apple season is upon us. With the warm spring, the apple blossoms were more abundant than they’ve been in 10 years in Finland. The pollinators got busy, and with sunny days and no rain during this glorious Spring it appears they’ve done their job well. We are now looking at apple trees loaded with apples, everywhere we go. 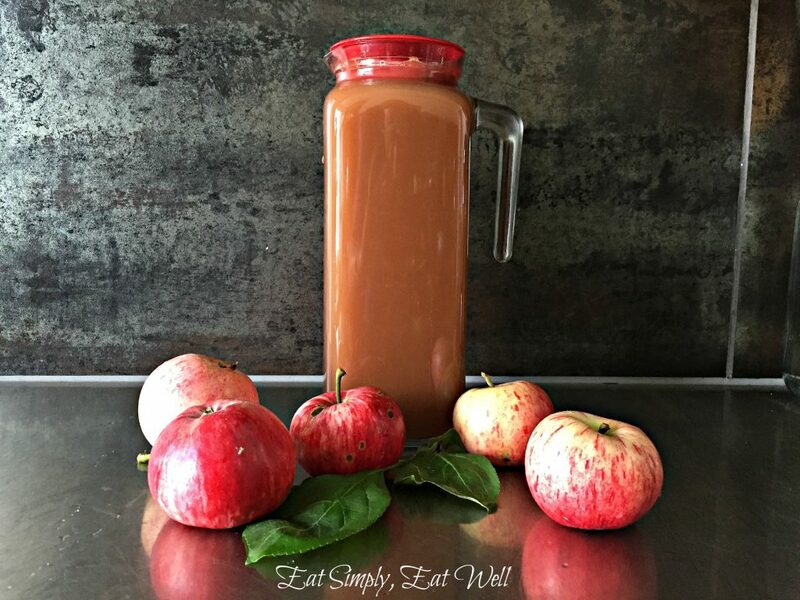 There’s no better time to make fresh apple juice. But if you don’t own a juicer or a juice press, how in the world are you gonna make apple juice? Turns out – there’s an easy way to get the job done. We don’t own any apple trees ourselves, but we do own “apple shares” in an organic apple farm, from which we get boxes full of beautiful, delicious Amarosa apples every October. No worries, though: my father-in-law has 2 apple trees in his yard that are ripe and loaded, and he’s more than happy to share. He sent me home with a big pail of apples. There could have been more, but I declined, because I reasoned: “what are two people going to do with more than 5 kg of apples”. But these apples. They were clearly apples meant to be pressed into juice. Heavy for their size, and so juicy you couldn’t bite into one without juice running down the apple, onto your hand and dripping on the floor, there would have been no point in trying to turn these into sauce or pie. But I had a load of them, and no juicer. So I decided to hack a juicer – with my blender + a linen bag. I washed the apples, removed the cores, left the skin on, and chopped them into thumb-sized chunks. I filled my trusty blender to the brim, and sent the blades spinning. After tamping the apples a few times, the blender made short work of the apples, and I was left with apple puree. I poured this through into a linen bag (a nut milk bag or old, clean t-shirt would work as well) twisted the top, and “milked” the juice out of the bag. My oh my. I wish I’d accepted more apples. We may need to go back for another visit tomorrow. This is seriously some of the best apple juice I’ve ever tasted. Fresh, clean, sweet, crisp, with just the right balance of tartness, I can’t say I’ve had better apple juice anywhere. And, well, it does give a whole new meaning to the concept of “hand-pressed juice”. So now, I’m on the lookout for more free apples (anyone?!?). I’m confident (er, strongly hoping) that apples will be available any day now – the neighbors down the road have the same challenge my father-in-law did does – more apples than they can eat off of trees producing record quantities. But now, that’s more a pleasure than a problem: forget making lemons into lemonade – it’s apple juice we’re talking about, and it’s way, way better. I used some of this fresh apple juice to create a new recipe for granola, and turned out the crispiest, chunkiest granola on record. Recipe to follow. But for now, apple juice. Unless of course you own a juicer; then use that. Though you’ll miss out on all the fun that’s about to follow, so you may want to try this anyway. The fun is just beginning! What are you going to do with all this your bounty? knife + cutting board + apple core remover (not essential, but faster. I use this one). Wash the apples to remove all excess dirt or grit. Remove the cores. Cut the apples into thumb-sized pieces (larger pieces are hard for the blender to deal with and get stuck on the blade if you fill the blender – which you will). Fill the blender container to the top and secure the lid. Turn the blender on to medium low heat, and blend the apples until they become a uniform puree. You may need to stop the blender a few times to stir the mixture if the apples get stuck. 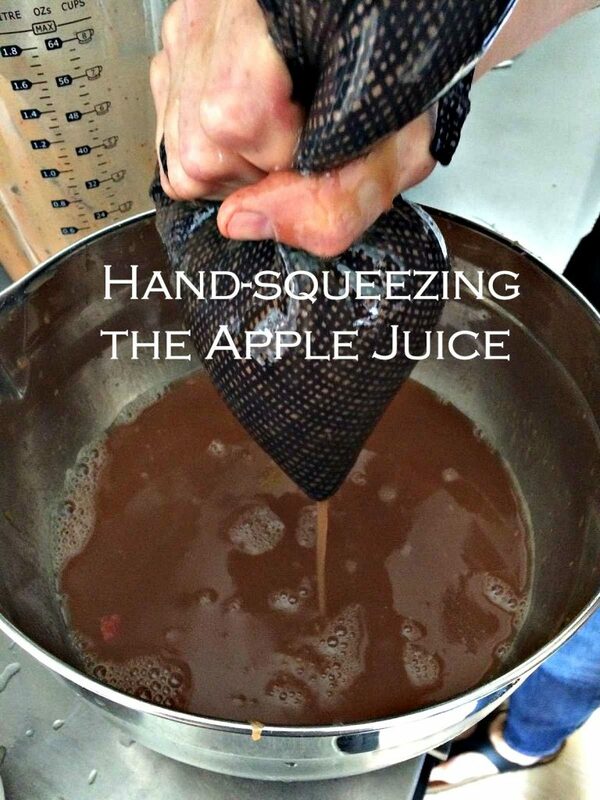 Pour the apple puree into your linen bag or milk bag. Twist the top of the bag several times, and hold the twist in your non-dominant hand. Hold the (now dripping) bag over a large bowl to catch the juices, and with your dominant hand (the one you write with), squeeze the mass of apple puree to “milk” the juice out. Continue pressing and squeezing the bag until the mass left in the bag is really small and very little juice is being extracted. You should get around 1.5 liters of juice from around 5 kg of apples, depending on how juicy your apples are. Serve immediately; store in the refrigerator for up to 5 days; or freeze for later use. Makes approximately 1.5 liters/6 cups of juice. Did you enjoy this recipe? 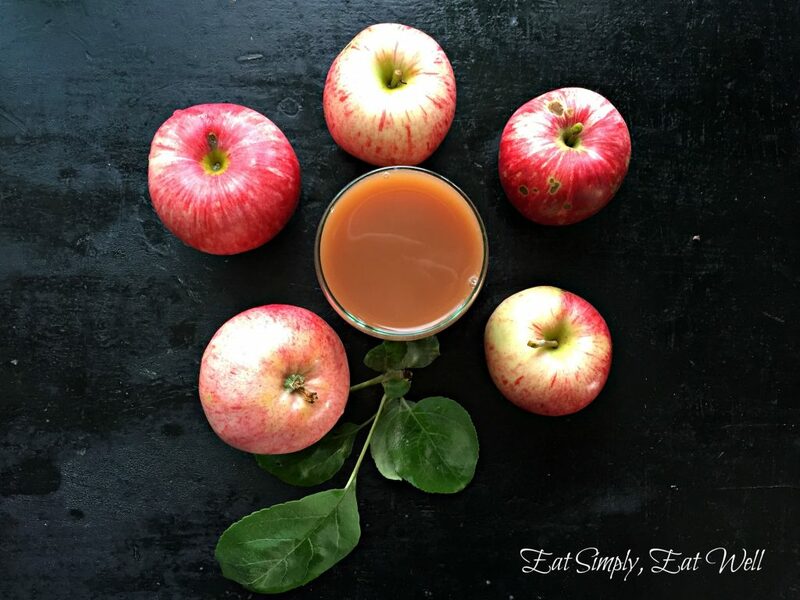 Do you have other tricks up your sleeve for using a bounty of fresh apples this season? Please share them below – I’d love to know! Have you signed up for the ESEW newsletter yet? Scroll back up to the top and fill out the form at the top, right-hand side of the page to get free tips and recipes I share there. Tomato Cheddar Pie. Just look at this thing. Summer doesn’t get any better than this: long, light days. Clear blue skies. Mostly warm. Scattered showers to keep the dust down and the garden watered. And produce ripening almost faster than we can pick it. Down in my small garden patch, the cherry tomatoes are really starting to take off, each small orb a delightful sweet & sour mouthful. And of course, eating them fresh is always a good idea, but if you want to take them up another notch, why not pie? Now pie. That’s a really good idea. 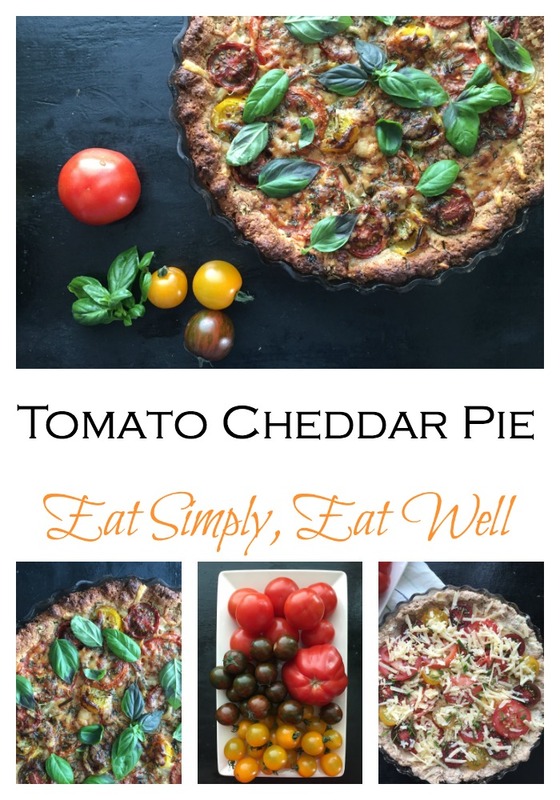 This Tomato Cheddar Pie was inspired by a recipe in Fine Cooking from the Aug/Sept 2013 issue, and has been modified slightly to suit my own taste. I think you’re going to love it, especially if you have a bowl of tomatoes in your kitchen begging to be consumed right now. The base is buttermilk biscuit which creates a nice flaky layer upon which the rest of the ingredients sit. The tomato juices blend with the herbs and cheese, but thanks to a sprinkle of corn flour over the base, it doesn’t turn into a soggy mess. I love the combination of chives, oregano and basil in this, but get creative – the tomatoes can take it! It’ll be delicious either way. Serve a wedge of this with a large salad of fresh summer greens and you’ll have fans gathering around your table. If you reheat this, I recommend doing so in the oven for best results. Combine the flour, baking powder, sugar and salt in a bowl. Add the butter to the flour mixture, and using a pastry blender or a fork, mash the butter into the flour mixture until the butter is the size of peas. Pour the buttermilk over the flour-butter mixture and stir to combine, using your hands to shape it gently. Don’t over process – you just need it to hold together. If you handle it too much, the crust will be tough. Wet your hands so your fingers won’t stick to the dough. Press the dough into the bottom and up the sides of an oiled 10″/25 cm tart tin. Sprinkle the cornmeal over the base of the crust in an even layer. Sprinkle half of the chives, oregano and cheese over the bottom of the tart crust. 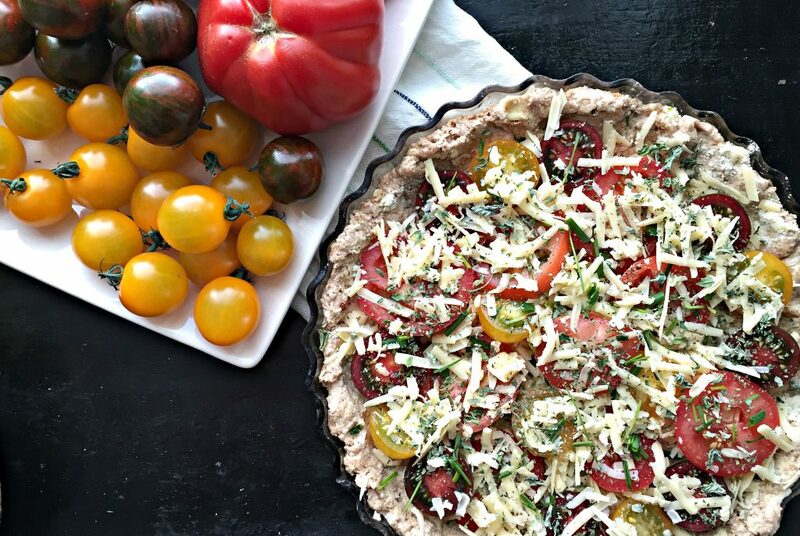 Arrange the tomatoes, cut side up, to cover the bottom of the tart. 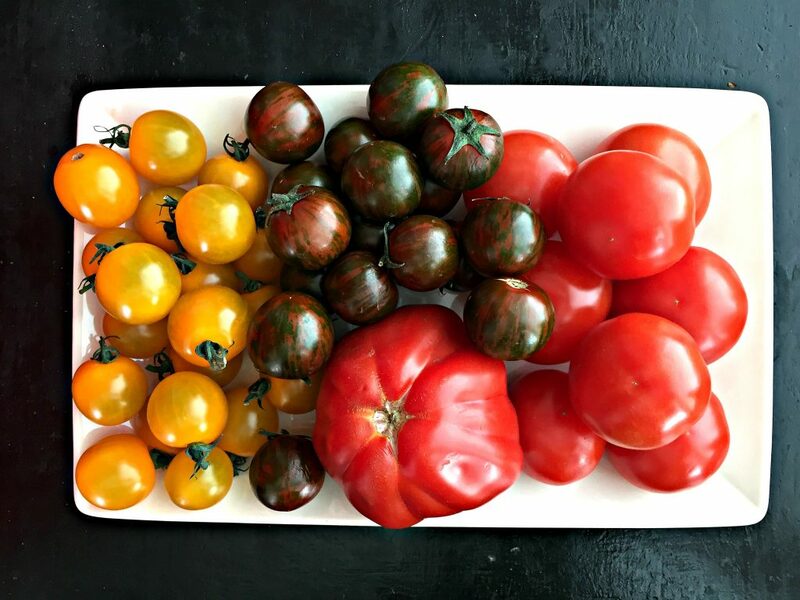 Sprinkle the salt and pepper evenly over the tops of the tomatoes. Drizzle with olive oil. Sprinkle the remaining chives, oregano and cheese over the tops of the tomatoes. Place the pie into the hot oven and bake 20-25 minutes until the crust is golden brown around the edges and the tomatoes begin to brown as well. Remove from oven and cool 10 minutes. Sprinkle the fresh basil leaves over the top, and serve. Did you enjoy this post? Please let me know in the comments below, and share it with your friends on social media!